Great Sandy World Heritage Area is part of the Tentative list of Australia in order to qualify for inclusion in the World Heritage List. I visited this tentative WHS in December 2017 and January 2018. If ever this site will get inscribed it will surely be as an extension to the Fraser Island WHS. In fact this part was already excluded from the Fraser Island WHS prior to inscription. If the logging problems are addressed effectively, I think that extending the inscription to the Great Sandy NP as a whole would further bolster the present buffer zone. 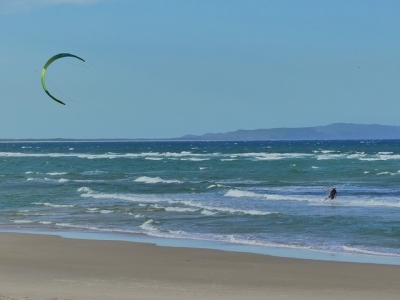 Currently, the Cooloola section is situated on the coast between Noosa Heads (a paradise for parakiting - photo) in the south and Rainbow Beach in the north and covers 18,400 hectares. There are information boards explaining the site's natural importance too. In 2007 I did a trip to Fraser Island that is already a WHS, but a little earlier I visited some places in this area that are not yet part of the WHS and will be an addition if the "Great Sandy World Heritage Area" will be created. When I stayed in beautiful Rainbow Beach for a weekend, I did some bush walks in Coolala National Park. It is a beautiful park with lots of rainforest and of course lots of sand. 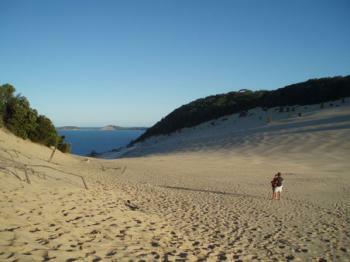 The most impressive place was Carlo Sandblow, a HUGE sand dune with a wonderful and spectacular view of the ocean. It was one of the first places I saw in Australia and I was overwhelmed, I couldn't believe how beautiful it really was. The same goes for Wide Bay, a very long beach that lives up to its name, and with some great, colourful cliffs to explore. They gave the town of Rainbow Beach its name and fascinating Aboriginal stories are woven around them. Rainbow Beach and the surrounding area is a gem often overlooked by international tourists, but it's absolutely worth a visit.